I am going to appoligize in advance. These photos were taken last night and don’t do my soaps justice. I am going to re-take all of them this weekend when there is some sunshine. I still wanted to post these two bars I made the other day. 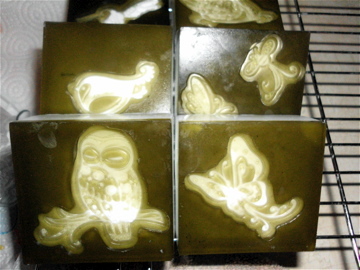 These are made by using stamps and carefully pouring. 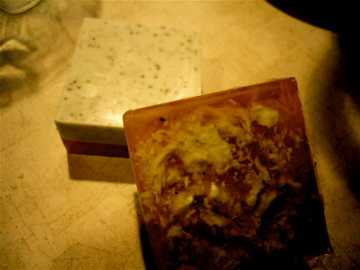 They are scented with White Tea and Ginger Fragrance oil and are made from Hemp and Honey MP soap. This bar (one is facing up and the other is upside down so you can see the bottom) looks much better in person. It is called Sunshine and is scented with Orange Valencia and Litsea Essential Oils. Both are said to be uplifting and it really does smell like summer and sunshine. There is Lemon and Ginger herbal tea mixed in for exfoliation. It is made up from Honey and Hemp MP. Previous Homemade vs. Commercial Next New items up on Etsy! Thank you! I put the stamp down first then poured different layers of MP. Once it was all hardened I peeled off the stamp. What a great idea! I really want to try this. Thanks so much for filling me in. Found your blog thru Teach Soap forums, and even though I haven’t graduated to CP yet I really picked up some inspirations here as a beginner. My mom and I are trying to put together our first public sale for Valentine’s Day, and I just love your simple style and craft show setups. Look forward to keeping up with you here!